A pencil case, also known as a pencil box, is a container used to hold pens, pencils, rulers, erasers, and other stationeries. Generally, the pencil case is made of wood, iron, plastic materials, and comes in various shapes, such as rectangular shape. As a Chinese pencil case manufacturer, we primarily produce double decker pencil cases with lovely cartoon character artwork. Our pencil boxes are made of high quality iron, making them more durable than wood and plastic pencil cases. Besides, they are colorfast and deformation resistant. 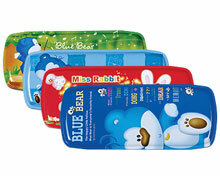 Hence, our pencil cases are the product of choice for schoolchildren. Apart from pencil case, we at Deli Stationery also produce other office supplies, such as utility knife, scissors, cutting mat, pencil sharpener, pen stand, ruler, file cabinet, ball point pen, and so on. These products are made in accordance with ISO9001:2000, ISO14001:2004 standards. So you can feel secure in using them. Whenever you are in need of our products, please contact us immediately. We are ready to serve you! Stapler1. High quality: Our stapler is produced in accordance with ISO quality standards. 2. "Twice injection and once molding" technique is adopted. 3. Our stapler is suitable for both No.10 and No.12 staples. Binder ClipSteel binder clips are widely used in offices and schools by office-goers and students. Use our binder clips, it will be easier for us to collect and classify files etc.